How Is Telemedicine and IoT Shaping Healthcare? The technology in healthcare industry continues to evolve rapidly. Many of the changes over the last decade involve the use of devices like medical tablets and all–in–one computers to track health records and diagnostics. The next degeneration in medical devices, leverages connectivity and data in a profound new way. Dubbed, the Internet of Things (IoT), WiFi or connected devices have given healthcare providers new tools and approaches to addressing patient care. In turn, IoT provides a patient with a platform that allows for easy access of information, treatment and convenience. For example, some hospitals have begun implementing “smart beds” that can tell if a patient is trying to get up or adjust to make the patient more comfortable without manual controls. Another example is medication dispensers that automatically record Rx use or a pill that alerts the doctor when swallowed. The technological developments that are used within the healthcare industry have changed its paradigm to such an extent that the interaction between a patient and healthcare service providers is rapidly being overtaken by electronic intermediaries. The reason why IoT technology flourishes within healthcare is because improving quality in patient care is at the heart of modern medicine. One ground breaking application is tech allowing people to access quality healthcare services in spite of distance. Think of a rural town hours away from a medical specialist. Telemedicine and the use of sensory equipment is filling the distance gap. A company called Medpod brings the doctor’s office to the patient. Medpod, backed by Henry Schein, is a revolutionary cloud-based “Virtual Health Clinic.” The mobile office integrates nurse-assisted physical medical access points with remote physicians. Medpod connects the patient, remote intake clerk, on-site nurse and remote physician via a live two-way video and medical data broadcast. Doctors can read vital signs in real-time and treat the patient accordingly, while the patient is able to communicate their concerns and medical history. 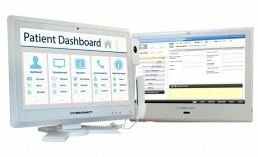 Cybernet provides the All-in-one Touch Screen, CyberMed C22 that is the true portal between patient and doctor. Clearly, the shift has begun to take on a more patient – centric model. Analysts predict that the shift towards a more personalized approach when it comes to healthcare will proceed at a steady pace. This prediction will wield negative consequences for healthcare administrators who refuse to use these technological platforms to improve the way they deliver healthcare services. It is a given fact that people are more invested in taking more responsibility for their own health concerns. The importance of this development is reflected in the Patient Protection and Affordable Care Act. The Patient Protection and Affordable Care act specifically states the need for healthcare administrators to use certified Electronic Healthcare Technology to increase the efficiency of the delivery of healthcare services and promote more consistency when it comes to patient care. The more you become aware of the impact that IoT has on the future of the healthcare industry, the importance of purchasing cutting edge technological tools becomes more pronounced. There is a need for healthcare administrators to direct their attention on purchasing medical computers and medical tablets to respond to evolving healthcare trends. The steady progress of IoT innovation is far too important for healthcare professionals to ignore. While the shift from a person-to-person interaction to the use of medical tablets and other devices may be startling at first, there are also advantages that are made available. An increase in the accessibility of healthcare services is something that IoT and Telemedicine are capable of producing. These platforms can also mean more affordable options for people who were previously hampered by cost concerns. Time will only hasten these developments so in order for healthcare service providers to maintain a competitive edge, they need to explore ways by which they can use cutting edge technology to accommodate processes and systems that are based in the internet of things.